A fast-paced office needs a speedy, user-friendly, and versatile printer for its success, which makes the Konica Minolta Dialta colour CF3102 a suitable contender. It is a high quality colour copier with multifunctional capabilities aiming to minimise downtime and operational costs. The Konica CF3102 colour copier boasts efficient paper management and a very networkable system for easy sharing in workgroups, but it is expensive and lacks many important features. This digital full-colour machine integrates a scanner, printer, and copier in one 85Kg device that measures approximately 596mm wide, 152mm tall, and 730mm deep. The Konica Minolta CF3102 all-in-one colour printer runs on 256MB of memory with default paper capacity of up to 751 sheets with the 500-sheet and 250-sheet cassettes and a single bypass tray. The control panel follows a universal design and it can be tilted for a better view or grip. The Konica Minolta CF3102 copier uses cartridge-type toners for cleaner and easier replacement. It is easy to operate with ample memory for built-in storage which enables later document printing. The Minolta Dialta colour CF3102 is fast, with speeds of up to 31ppm in monochrome or colour. The intuitive copier allows for on-board booklet creation, colour adjustment, departmental control, photo mode, and OHP interleaving functions. The maximum paper capacity of the Konica Minolta CF3102 photocopier can be increased to 3,250 sheets. It is easy to integrate the device into a network. Konica CF3102 cartridges contain up to 10,000 pages of toner and deliver a cheap cost-per-copy. 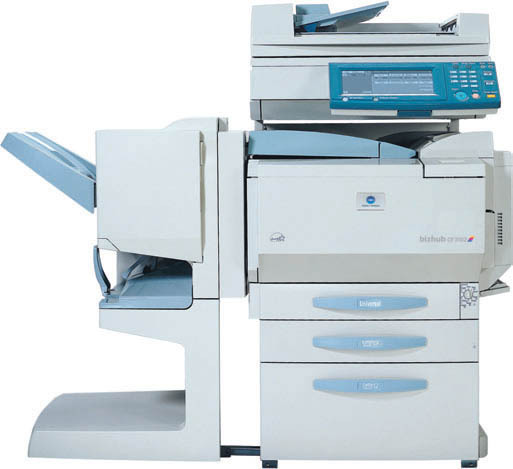 The expensive purchase price, weight, and bulky build are among the main drawbacks of the Dialta CF3102 copier. Apart from that, important features like the duplexing document feeder, 30-sheet stapler finisher, printer controller, and the duplexing unit are only optional for the Minolta CF3102 colour laser printer. The maximum copy resolution is limited to 600dpi, so the quality of very detailed documents might be compromised.